Where the major political parties has decided not issue ticket for upcoming Nagaland Assembly Polls, on the same time a Konyak woman file her nomination form 47 Aboi Assembly Constituency. However the state unit of BJP backed out of a joint declaration signed on Monday by 11 parties, national and regional, in the State to boycott the ensuing Assembly elections. Awan N Konyak will become the first Konyak woman to contest Nagaland Assembly polls. She plans to succeed her father, former Minister, Nyeiwang Konyak, representing the 47 Aboi Assembly Constituency. Awan declared her candidacy in a programme on Friday at their residence in Aboi Town. Awan Nyeiwang Konyak completed her Master of Philosophy from Delhi University, is a citizen of Ngangching village, and lives in Aboi Town. 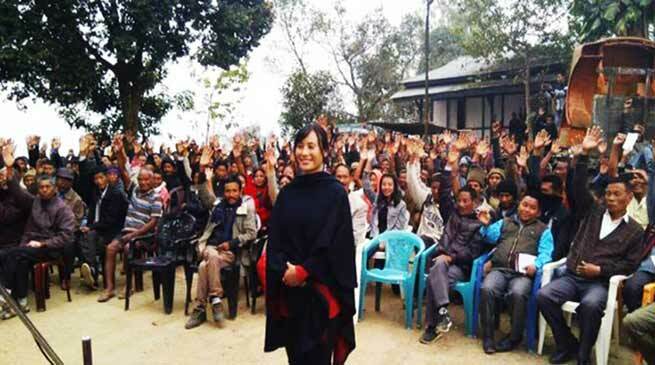 Her father, Nyeiwang Konyak, had also won the MLA seat from the same constituency several times. She clarified that with respect to the ongoing talks for an early solution to the Indo-Naga issue, she would adhere to the decision made by the Naga public. During the programme, Awan said her dream was to complete the incomplete task of his father’s dream for the constituency with progressive development and to elevate the status of women in Naga society. “The best is yet to come,” she added. The 47 Aboi A/C is represented currently by Eshak Konyak who won the seat after a four-way contest in 2013. Eshak, representing the Indian National Congress, beat his nearest rival, Awan’s father and former Education Minister, Nyeiwang representing the Naga People’s Front.